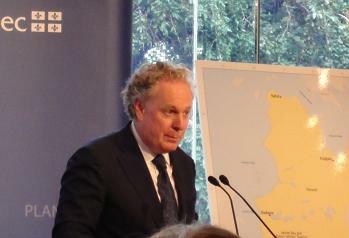 After Dr. Claude-Yves Charron's brief introduction that Quebec Premier Jean Charest is the first Canadian politician who has officially visited Japan since the big earthquake and tsunami on March 11, Mr. Charest gave his speech on the recent economic performance of Canada in general and Quebec Province in particular, emphasizing the strengths of the economy based on new competitive industries as well as various natural resources. 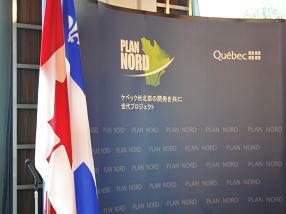 In this context, the Prime Minister outlined the Plan Nord, which is called the project of a generation. 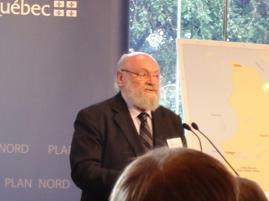 Spread over 25 years, the project will lead to investments totalling more than $80 billion for sustainable development in Quebec's northern territory, which is rich in natural resources. He concluded with his prospects for a new relationship with Japan for mutual economic properity and interaction in trade and investment.